Questions: Discussion Site or new ANTsDoc or try this version ... also read our guide to evaluation strategies and addressing new problems with ANTs or other software. New ANTs handout, part of forthcoming ANTs tutorial material. Install ANTs via pre-built: Packages @ github older versions @ sourceforge ... also, Github Releases are here thanks to Arman Eshaghi. 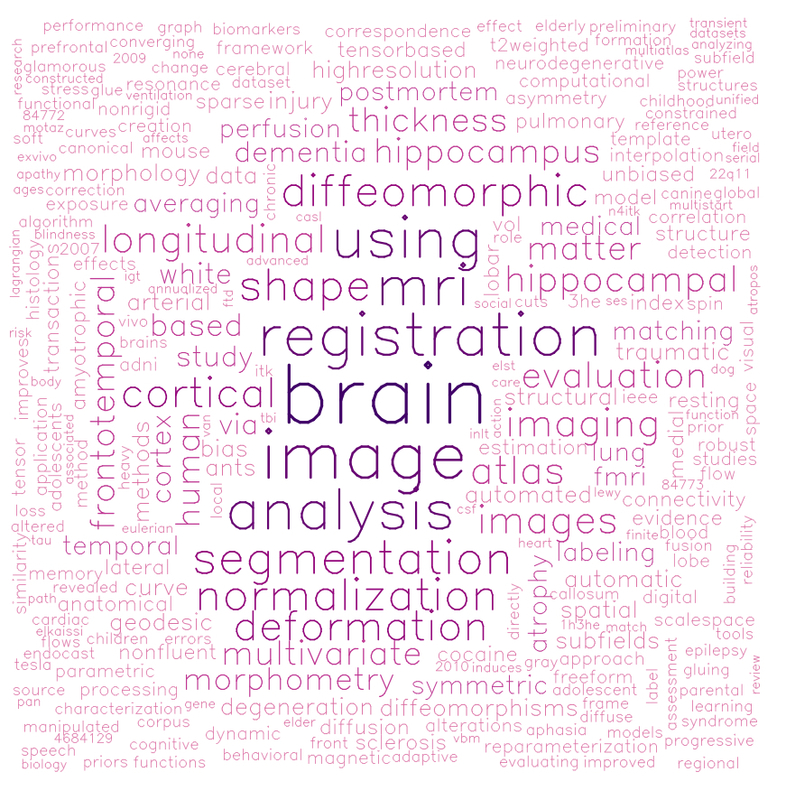 ANTs extracts information from complex datasets that include imaging (Word Cloud). Paired with ANTsR (answer), ANTs is useful for managing, interpreting and visualizing multidimensional data. ANTs is popularly considered a state-of-the-art medical image registration and segmentation toolkit. ANTsR is an emerging tool supporting standardized multimodality image analysis. ANTs depends on the Insight ToolKit (ITK), a widely used medical image processing library to which ANTs developers contribute. A summary of some ANTs findings and tutorial material (most of which is on this page) is here. morphology, GetLargestComponent, CCA, FillHoles ... much more! We will analyze multiple modality neuroimaging data with Advanced Normalization Tools (ANTs) version >= 2.1 1. ANTs has proven performance in lifespan analyses of brain morphology  and function  in both adult  and pediatric brain data [2,5,6] including infants . ANTs employs both probabilistic tissue segmentation (via Atropos ) and machine learning methods based on expert labeled data (via joint label fusion ) in order to maximize reliability and consistency of multiple modality image segmentation. These methods allow detailed extraction of critical image-based biomarkers such as volumes (e.g. hippocampus and amygdala), cortical thickness and area and connectivity metrics derived from structural white matter  or functional connectivity . Critically, all ANTs components are capable of leveraging multivariate image features as well as expert knowledge in order to learn the best segmentation strategy available for each individual image [3,4]. This flexibility in segmentation and the underlying high-performance normalization methods have been validated by winning several internationally recognized medical image processing challenges conducted within the premier conferences within the field and published in several accompanying articles . ANTs is maintained by stnava. This page was generated by GitHub Pages using the Cayman theme by Jason Long.